It is not often that one comes across an artist who devotes his entire artwork to the industry and that is just what Lu Lei, a retired school principal had done. Lu, who is the former principal of Chung Hua High School of Port Dickson has moved to a seaside residence in the coastal town where he is happily practicing his Chinese calligraphy passion. The Seremban advisor of the Calligraphy Society of Malaysia said that he is indulging calligraphy and painting as they keep him sober and a clear mind. He is very active in promoting this art form and in doing trying to get more people to appreciate and to get involve, he always give away his works. He is one of the earliest artists who have put Malaysian in the world map when he represented Malaysia in the Commonwealth art exhibition in 1962. Since then, he has been known as one of the prominent Chinese calligraphy artists of Malaysia while shouldering the responsibilities of leading a school for more than 20 years. 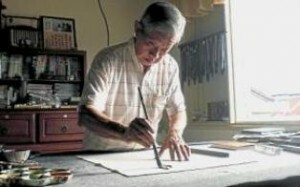 At 82, he surely knows where to indulge in his own artistic world amidst the slapping waters of the sea in Port Dickson. He is currently working on a 3-in-1 book that includes a combination of poetry, calligraphy and painting which he aims to complete before the year ends. As an artist, he used to coach students although he no longer does that. Instead, he still offers valuable advice to the younger generations who work with calligraphy and art.